Welcome back to fan art appreciation hour! This will be the last installment in the series for now, until I unearth even more hidden gems the Internet has to offer. I think this digital painting of Samus done by Transfuse (Ivan Flores) back in 2006 is probably one of, if not the most iconic video game character fan artwork out there, period. And for good reason. 36 hours of work was put into a very mature rendition of our beloved bounty hunter. The immediate draw in this photo are the blood and large scratches on her Power Suit. It appears that she's overcome a grueling battle, and though she may seem vulnerable, her fighting stance demonstrates her admirable perseverance. If anything, the fact that her arm cannon is still glowing intensely is a clear indication of that. My favourite detail, however, is actually the blood in a couple of her hair strands. It's not incredibly in-your-face, but rather it blends in with the rest of the colours in this painting remarkably well. It's certainly a bold, yet very fitting choice by the artist. Even if they are Nintendo's intellectual property, the games themselves aren't always necessarily marketed to a younger audience, and it's not unrealistic to assume her job wouldn't put her in conditions like this. Her helmet is nowhere to be seen. I assume she either lost it or it was destroyed in combat. Nevertheless, she's clearly not afraid to press on without it. She's a resourceful and experienced bounty hunter, so she'll definitely find a way to protect herself. This is also a nice way for players to connect with her on a more intimate level. I'm glad Transfuse chose to do away with the anime look Nintendo games are typically known for, instead opting for a sense of realism in Samus' design. The Suit in particular looks sturdy, giving off the impression that it's been reliably protecting Samus throughout her ordeal. At the same time, there's understandable weight to it, but Samus is clearly comfortable in her armour and shows no hesitation nor difficulty in handling her deadly weapon. The cannon is her companion, as evidenced by her hand placed on top of it. I also like that the painting as a whole isn't gritty. It looks more like a mix of creamy glaze and Tenebrism. These techniques allow the shadows and muted colours to harmoniously contrast with the neon lights so as not to have the end product be a (literal) glaring clash of hues. The masterful execution of these techniques allow us to focus on what's most important—Samus' stoicism even in the gloomiest of environments, which still manages to be humanistic without the overly dramatic ferocity. This fan art has official art book status written (or in this case, painted) all over it. Heck, it deserves to be on the cover of a game case. Nintendo, do I really need to say it? In Mario's jolly and cartoony world, even the menacing King Koopa himself honestly looks like a cuddly ball of cuteness despite his "obvious villainous character is obvious) chokers, horns, claws, and spiky shell. 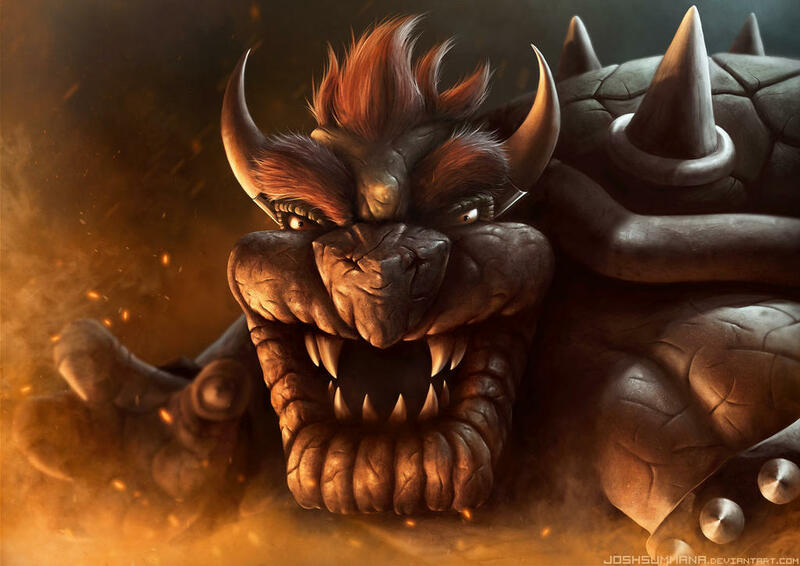 Though that didn't stop Deviantart user JoshSummana from completely reimagining Bowser as a (literal) stone-hot, killing machine using digital painting and airbrushing techniques with a graphics tablet in Photoshop. The finished product takes clear influence from Dave Rapoza's works. I'm almost certain I recall it drawing inspiration from Godzilla in the 2014 movie reboot as well. However, I can't seem to find the original photo that I keep thinking of for comparison. Regardless, Bowser here sure looks the part of a serious contender against Japan's other famous fictional giant monster. I'm glad the artist went ahead and made Bowser's entire exterior look as though it's composed of iron, metal, and bronze materials, and didn't just leave these extra touches for his shell solely. This composition is most notable in his sharp and rocky face. The added scars give him a very brutal and primeval mien, and it all leaves us with the impression that he's an indestructible force that's been in countless, lifelong battles. Those frighteningly varnished teeth and horns are perfectly curved and sized, contrasting nicely with Bowser's conical claws and spikes. I love how his "hair" actually looks touchable in this piece, too. You can practically see every thick and coarse strand, the shapes as a whole resembling brilliant flames. Speaking of which, Bowser's eyes have that dangerous gleam in them, realistically reflected by the bordering flames. This coruscating blaze casts a glow on Bowser's face that is warm, yet intense at the same time, setting the tone for a plumber's worst nightmare. People might say this is a creepy look for the leading kappa. It's a little unsettling, absolutely, but I nevertheless think it's badass and could pass for a movie poster if I didn't know any better. Just slap on the title, "Bowser vs. Godzilla: The Gargantuan Chronicles," the credits, and a release date—and I'd be sold. There's a lot of creative, and even cute fanart of Did You Know Gaming's Shane—based on the Youtuber of the same name—floating around the Internet. However, this one is my favourite by far, and I'm so sad that I cannot for the life of me find the artist. All I know is that it's from Tumblr. If anyone recognizes this image and can tell me the artist's name so that I can properly credit them, that would be fantastic. I'm not entirely sure which techniques were used to produce this illustration, but my guess would be a mix a digital paint and pastels. the moon's shine and words—the result of calligraphy—were likely photoshopped in with effects. If anyone wants to weigh in on this, they're more than welcome to do so. Regardless of the behind-the-scenes work, I really like the pleasant contrast between the muted colours and soft whites. It all really gives off the impression that an eclipse is happening behind Shane as he's... communicating telepathically with aliens? I have no idea. It's a totally fresh take on the tsundere of our dreams—the perfect manifestation of stoicism on the outside and pure "doki doki" on the inside. I like how Shane looks as though he's in a trance under the moonlight, all while a multitude of thoughts—actual quotes by both Asagao and real-life Shane—are swirling around in his mind. Without those thoughts, this piece could pass for the cover art of any mystery sci-fi game. With them, the entire concept is just so much funnier, and could really make for a great Asagao parodic spin-off. Who knows, maybe Asagao Shane really is an alien from another planet, taking some time to recuperate from a hard day's work of oppressing pink-haired protagonists to reflect on his observations. I reckon this fanart is the optimal way to conclude yet another listicle, so I'll leave it at that.